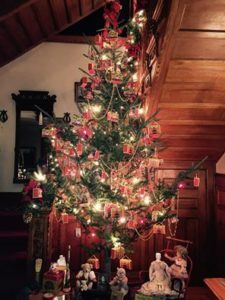 (Stocking) hats off to our innkeepers who embrace the holiday season with enough good cheer to stretch all the way from Wisconsin to the North Pole. 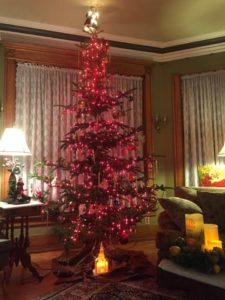 Get ideas for decking your halls from our own “cheer” squad of B&B owners. If you’re feeling ho-humbug about your holiday decorations, we have some ideas that will cheer you up in the wink of an eye. 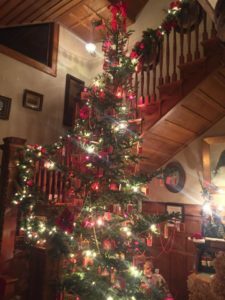 The front door of the The Lamppost Inn is stately on its own, but when the innkeeper adds holiday touches of greenery and decoration fit for the season, it’s a very fine welcome indeed. 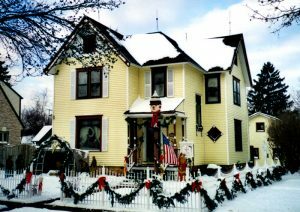 Whether you are a first time B&B'er or a seasoned one, you'll find this inn intriguing and cozy. At Fargo Mansion Inn, the owners take pride in their trees. Magnificently decorated, the mansion is sure to help you capture the spirit of the season. Whether you are in town to visit family or friends or attend a holiday party, you are sure to be warmed by the charm of the inn. 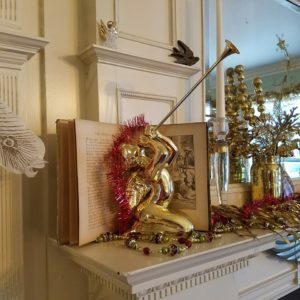 If magical and whimsical is your mantra, then take a cue from the innkeepers at Christmas House B&B, who create a lovely fireplace mantle vignette for all to enjoy. 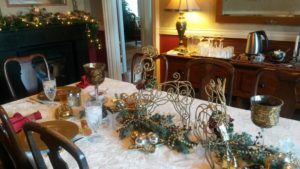 At Christmas House B&B, the innkeeper loves to fill up the rooms of the house with decorations of the season. Here’s one of our favorite holiday centerpieces on the dining room table of Apple Tree Lane B&B, where a full, delicious breakfast is served each morning. Early risers at Apple Tree Lane B&B can awaken to freshly brewed coffee and teas, set up on the buffet to enjoy with the morning paper before breakfast is served. Last but not least, outdoor lighting. 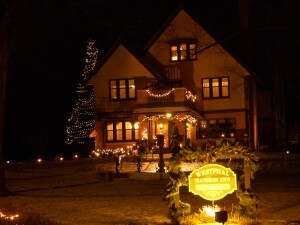 This twinkling scene at Westphal Mansion is fit for the cover of a holiday card. Inside, a crackling fire invites quests to cozy up with a favorite book or play a game of chess next to a warm fireplace in the living room.